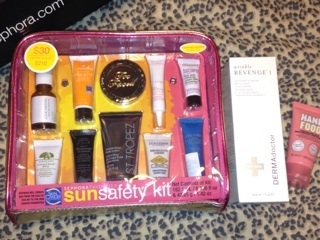 I still had a Sephora gift card from Christmas and am glad I saved it as I was able to get the Sun kit they release every year. 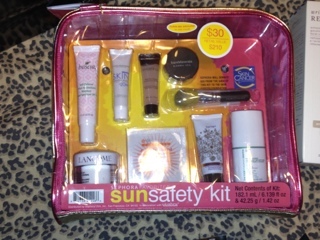 This Kit looked great- 14 deluxe samples: Too Faced chocolate Bronzer, and several different facial moisturizers, including Lancôme, Clarins, Tarte and more! I've yet to open (much restraint!) because I am trying to use the several (almost empty!) ones I have open. The bag would make such a pretty makeup bag- its hot pink and gold, but is clear- which I love, makes it easier to find everything! Will review it and all it's contents soon! Also bought some DERMAdoctor Wrinkle Revenge Face wash, that was recommend to me by the rep that was working at Sephora that day. His skin was flawless and glowing! I've only used it for a week or so, but love it so far. Spotted Soap & Glory Hand food lotion and was excited as it's a blogger favorite. Feels great, as I have super dry hands lately. 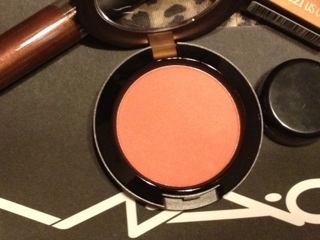 Also picked up the MAC blush Ripe for Love, which was part of their Temperature Rising Collection. 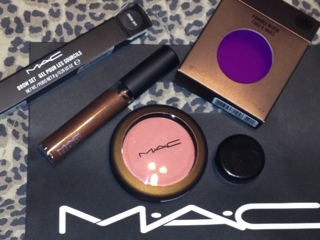 I usually don't pick up anything because, I cannot get myself to spend the money on MAC, especially since drugstore makeup is what it is now- great! But I really liked , it's described as a, Mid-tone peach. Haven't used it yet, but am looking forward to using it for summer. I also love the bronze rubber packaging:) grabbed my fave Brow Set in Show off as my current one is completely dried up. My eyebrows aren't as full as I'd like them, this actually helps them appear semi full and is always in my makeup bag. Lastly I saw this cute Eco Tools kabuki brush (which I think is new). It's travel friendly and sleek and fits perfectly for on the go. I've use it to set my powder and love it! It's so soft! The two blue nail shades are gorgeous!